Time has come again to do our best to organize and i always find that if teh new idea of organization is not simple enough – it just is not going to get done. So here is a very simple idea to not only organize jewelry but it will also allow you to show them off in style….. and it is very simple to do as well. You will need a wooden hanger and twenty small hooks – along with something to start a hole (we used an awe)! Carefully mark placement of places to start your holes (ten on each side). Use what you are going to start your holes with and make a impression with it. Screw hooks in by hand making sure the ones that are on the left face the left and ones on the right face the right. Here we have left it in its natural state but the whole thing could be painted with a can of spray paint to suit your decorating style and then cover with two or three layers of polyurethane. These can be used in a closet or be bold and hang it right above your dresser. 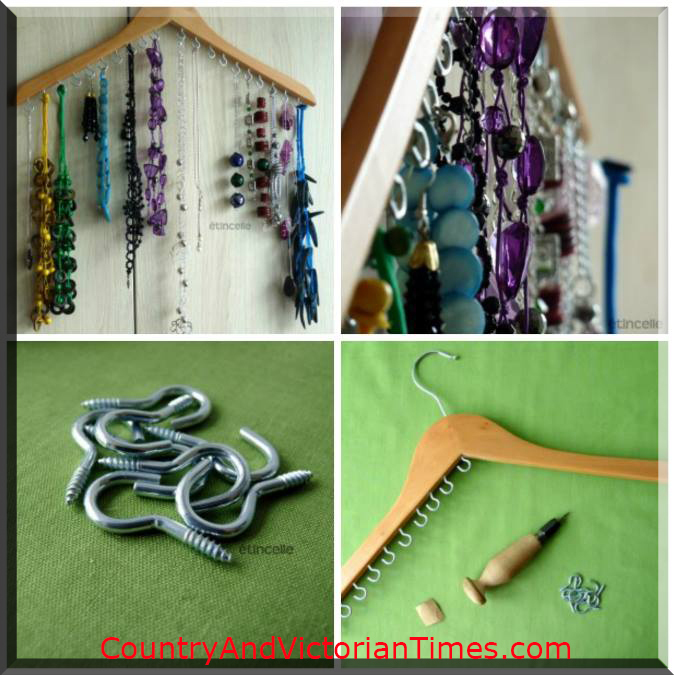 This entry was posted in Home, Car, Yard, and Pets, ~Recycle & Upcycle, ~Storage & Organization and tagged bracelet, decorate, Do it yourself, fashion, Garment Racks and Hangers, necklace, necklaces, organize, Store Fixtures, ~Jewelry. Bookmark the permalink.